Advances in miniature lasers, frequency combs, and drive & stabilization electronics were presented at the Jin Fest! 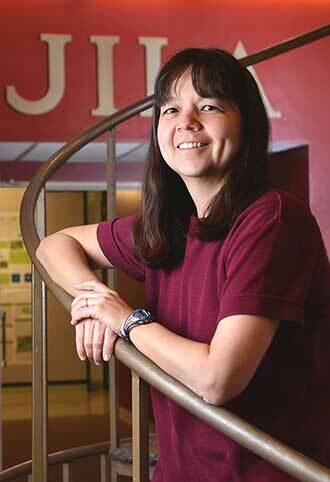 celebration of Deborah Jin’s career in and contributions to the field of optical physics. Friday 14 June 2013 at 11:15 am, Room 212 A-C.
Poster: “Laser system 2013 v1“ on Tuesday 4 June from 4-6 pm in room 400A. a new electro-optic architecture” Scott R. Davis, Seth T. Johnson, Scott D. Rommel, Neil A. Rebolledo, Michael H. Anderson, Vescent Photonics Inc. Presentation: “New electro-optic laser scanners for small-sat to ground laser communication links” Scott R. Davis, Scott D. Rommel, Seth T. Johnson, Stephanie M. McMahon, Neil A. Rebolledo, Michael H. Anderson, Vescent Photonics Inc.; Yijiang Chen, Tien-Hsin Chao, Jet Propulsion Lab. Presentation: “New electro-optic laser scanner designed for continuous coverage over a 120 x 120 degree field of regard” Scott R. Davis, Scott D. Rommel, Seth T. Johnson, Neil A. Rebolledo, Stephanie M. McMahon, Michael H. Anderson, Vescent Photonics Inc.; Jason M. Auxier, U.S. Naval Research Lab. 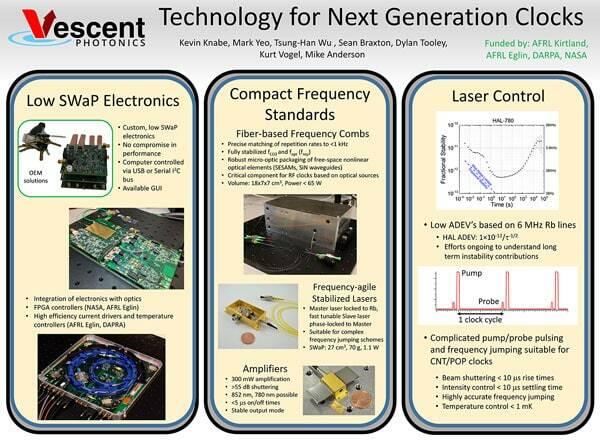 Presentation: “Miniature, compact laser system for ultracold atom sensors” Juan M. Pino, Mike A. Anderson, Benjamin Luey, Vescent Photonics Inc.
6770 W. 52nd Ave., Suite B. © 2019 Vescent Photonics. All rights reserved.